When disaster strikes, whether it comes in the form of water damage, or mold infestation—it can have a huge impact on your daily life. DryAgain Water, Mold and Fire Restoration Services is a family owned and operated company, which means that we know how important it is to protect your valuable property investment, and restore your home back to its pre-loss condition as quickly and thoroughly as possible. It is important to call a professional restoration team as soon as possible following the initial incident and at DryAgain Water, Mold and Fire Restoration Services we have four wheel drive equipment for all weather emergency responses. Our team of highly-trained professionals is available to help you 24 hours a day, 7 days a week, so don’t wait! 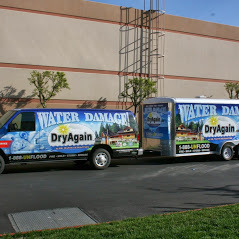 At DryAgain Water, Mold and Fire Restoration Services we guarantee quality workmanship and on-time, dependable service. Whether you contact us about an emergency situation or just a routine mold inspection, you will always receive the same courteous and professional treatment on every job. Call or email us for your free consultation, and we’ll send our team of uniformed, IICRC certified technicians to serve your every need. The first step in any restoration situation is assessment. Our team is trained for mold inspection, testing, and remediation, as well as water damage restoration services. When we say that DryAgain Water, Mold and Fire Restoration Services is a full-service restoration company, we mean it. Since every restoration scenario is unique, we tailor each and every job to the situation to make sure that you, our valued customer, get the best possible result at every stage of the process. There is no job that is too big or too small for the experts at DryAgain Water, Mold and Fire Restoration Services. Our service professionals are all highly trained, continually educated, and licensed—including IICRC certification. That means that we have made the investment in our team, our equipment, and in the future of your home or business. DryAgain Water, Mold and Fire Restoration Services has specialized in insurance losses since 1989, which means that we have the experience necessary to help you navigate through the red tape. We will work together with your insurance adjusters to reduce your out-of-pocket costs, whatever the circumstances, streamlining the claims process as much as possible. Because we want you to have the best service possible, whatever your budget constraints may be, DryAgain Water, Mold and Fire Restoration Services even offers senior citizen and non-insurance discounts. There is no reason to wait, especially when doing so can worsen the condition of your property. At DryAgain Water, Mold and Fire Restoration Services we are here to help you 24 hours a day, 7 days a week. Don’t wait, call (909) 337-7900 or email us at trevor@dryagain.com for your free, no obligation estimate. At DryAgain Water, Mold and Fire Restoration Services we know that there are few things more distressing than being asked to wait for the help you so clearly need. In the event of a flood, the clock is ticking, and the longer it takes to get professional assistance, the worse off your property, inventory and possessions will be. At DryAgain Water, Mold and Fire Restoration Services we not only understand the need for haste but also how upsetting this tragedy can be. That’s why we guarantee that a service professional will arrive at your location in 60 minutes or less following your call. DryAgain Water, Mold and Fire Restoration Services is the company you can count on in an emergency! Water damage is one of the most common problems that any property owner will face, no matter where you live. Since water damage can appear as a result from any number of sources, there’s no telling when or where you’ll need our services. The only thing you can count on is that the water damage restoration experts at DryAgain Water, Mold and Fire Restoration Services will be there when you need us most. Water damage may come as a result of storm damage, flooding, freezing or improperly sealed pipes or foundations, or even as the result of a fire. No matter what the cause, water damage that goes untreated may lead to problems such as swollen plaster, soft, spongy, or rotting wood, musty odors caused by mold, stained or ruined carpeting and upholstery, and a general devaluation of your property. There is only one way to deal with water damage, and that is quickly! Call the IICRC Certified water damage restoration experts at DryAgain Water, Mold and Fire Restoration Services. We understand that all water damage situations are urgent—and we will respond accordingly. We know that the longer your water damage goes untreated, the higher the likelihood that the damage will be irreparable and we are committed to restoring your property to its original pre-loss condition. At DryAgain Water, Mold and Fire Restoration Services we know that if water damage is not detected and mitigated quickly, it often leads to other problems—namely: mold. Even small amounts of water damage can elevate the humidity within any closed indoor environment, and when that humidity rises it creates the perfect conditions for a mold infestation. Whether you require inspection services, or merely to have the mold you are already aware of tested and safely removed, it is a good idea to hire a professional service. The service technicians at DryAgain Water, Mold and Fire Restoration Services will provide your home or business with a complete inspection following a positive result in a professional-grade mold test. The experts at DryAgain Water, Mold and Fire Restoration Services deal with water damage every day and we know that, unless the drying-out process is thorough, any moisture left behind can create an environment that is hospitable to mold. We will detect any occurrence of mold within your home or business, and remove the affected materials in a safe and environmentally-friendly way. Call (909) 337-7900 or email us at trevor@dryagain.com today to schedule your inspection! At DryAgain Water, Mold and Fire Restoration Services we are here to help you 24 hours a day, 7 days a week. 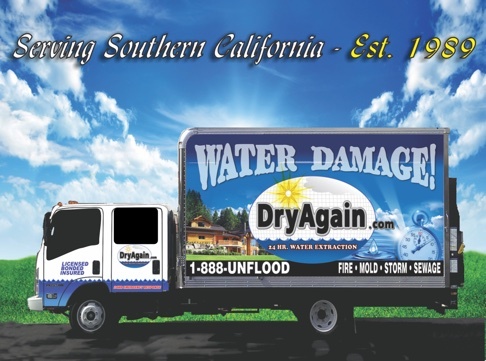 Don’t wait, call (909) 337-7900 or trevor@dryagain.com now for your free, no obligation estimate. The best advice we have for you is: don’t wait!